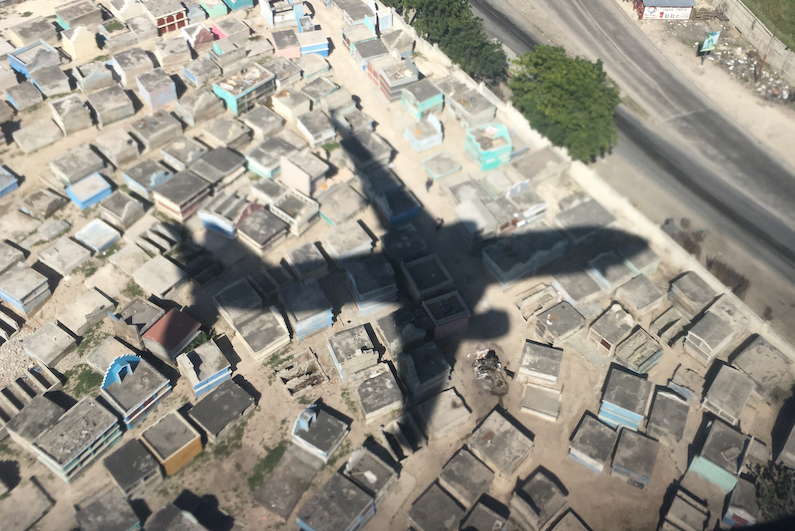 Thank you all for your thoughts, prayers and concerns for our work and for the country of Haiti. 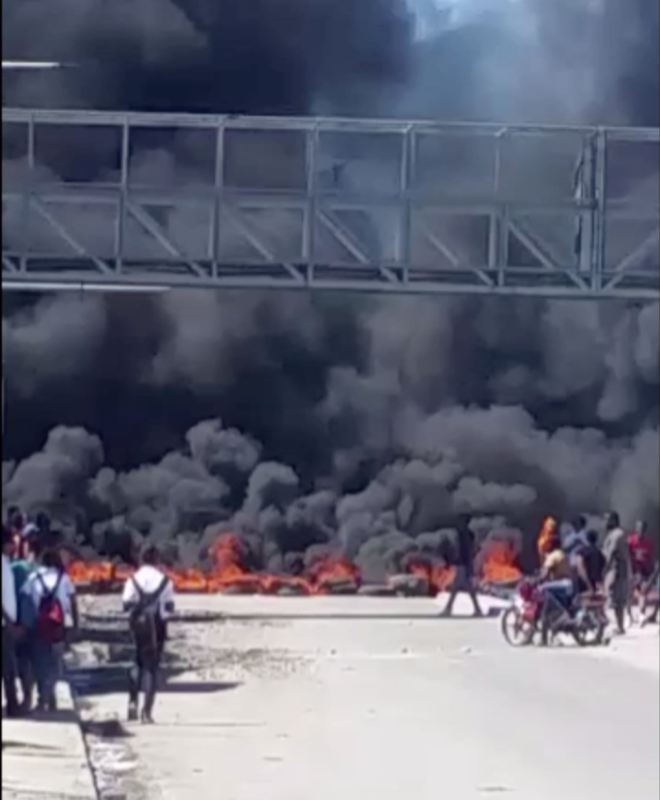 Things have been tense over the past several weeks with violence and protests aimed at overthrowing a corrupt government. Police are in a particularly precarious situation as many of them are in agreement with the aims of the protesters yet are being asked to maintain law and order. The upheaval has disrupted life at every level. People have not been able to move freely about the city, markets, banks and petrol stations were closed for over a week and since have only been open intermittently. People are unable to access basic necessities. Fear and lawlessness is becoming the norm. This has had a negative impact on hospital census and income. In this gutsy 6 minute episode of Vice https://www.youtube.com/watch?v=3eNzEGEsxr0 one can get a quick overview of the situation which exposes a lot of unanswered questions. The unfinished bridge scene at 2 minutes is 1/2km from Hôpital Adventiste and marks the home stretch of my morning running route. 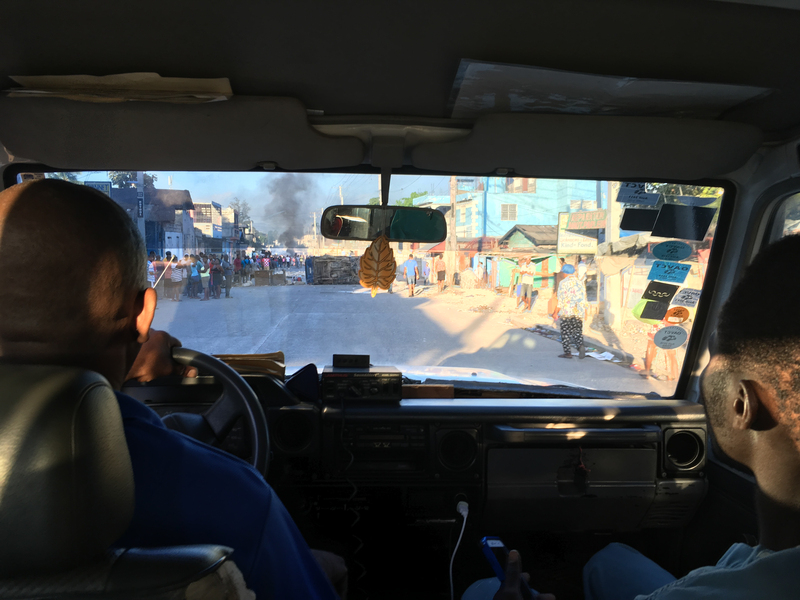 Additional fury was created when some heavily armed US mercenaries were caught red handed by the Haitian police in an unmarked vehicle that belonged to top Haitian government officials. 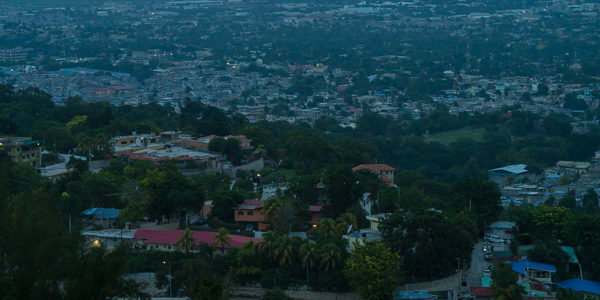 These ex-navy seal snipers who specialize in top level security jobs had barely made it out of the airport on their ill-fated mission when they were apprehended by the Haitian traffic police and then thrown into the local slammer. 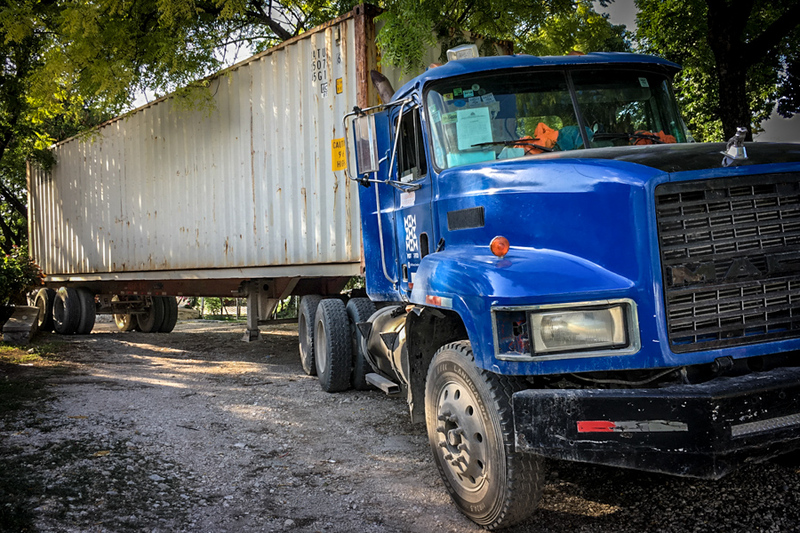 Some unknown negotiations between the US embassy and the Haitian government allowed them to return to PAP airport in shackles. 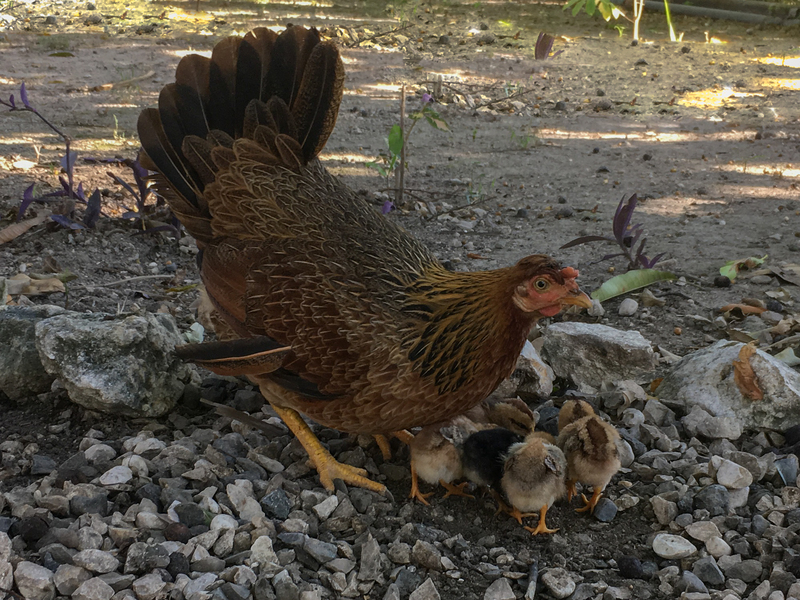 American Airlines required them to be unshackled prior to boarding and then they were set free when they arrived at MIA. News of the botched operation has gone viral and basically ruined any future clandestine security opportunities for these questionable characters. In the meantime the president denies having anything to do with them. 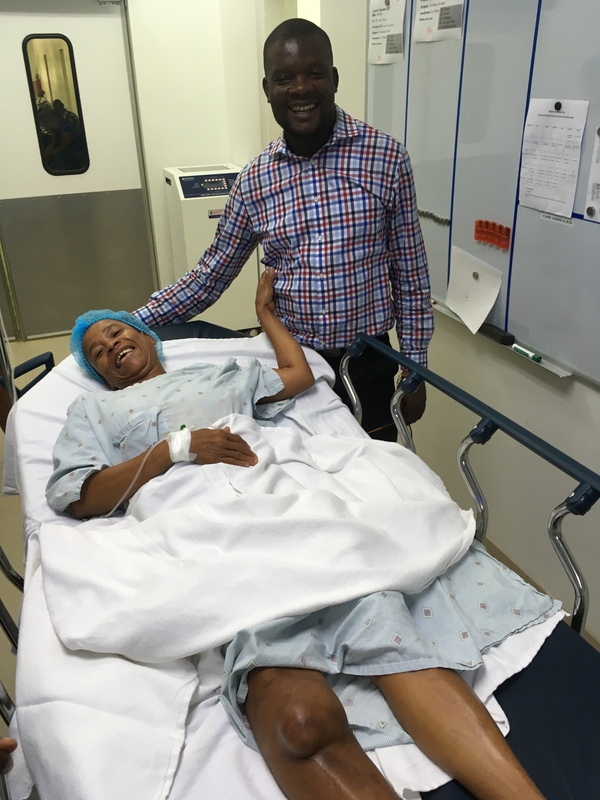 Dr. Alexis was unable to come to the hospital for over a week due to all the roadblocks and manifestations. 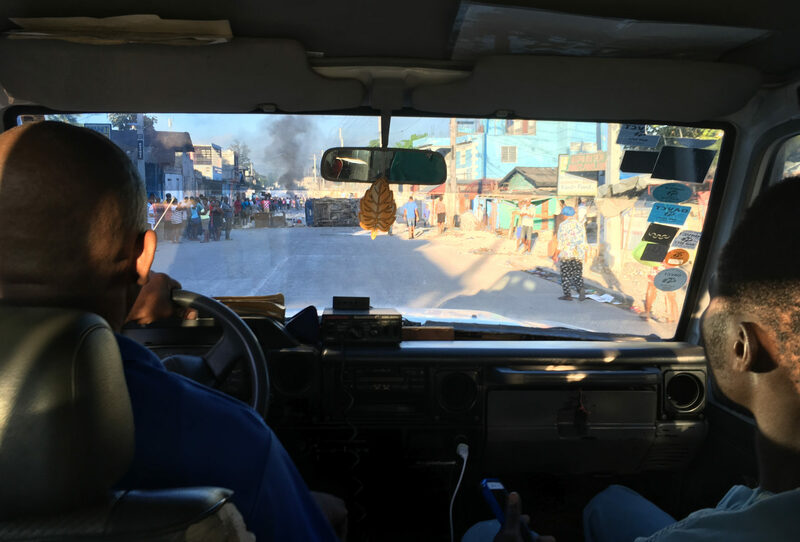 Most of the employees live in the local neighborhood and were able to make it to work, although for several days we did not even have a single patient make it to clinic or surgery. I held down the ortho service during this time – which was not difficult. 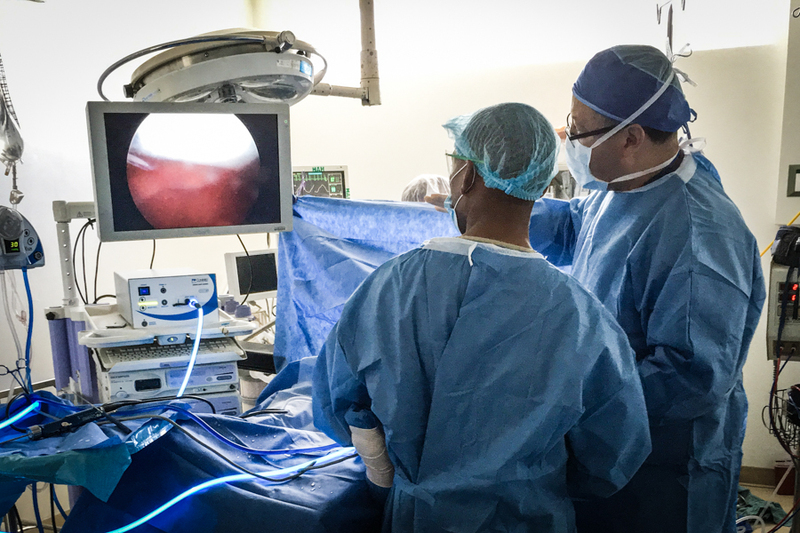 We took advantage of the situation by doing a lot of spring cleaning and organization of materials in the OR. Food and fuel stocks ran low, but thankfully never completely ran dry. As for danger – there have not been any direct attacks aimed at us or unnerving events at our hospital or the immediately adjacent area. We do often hear gunfire and yelling down the street and off in the distance. 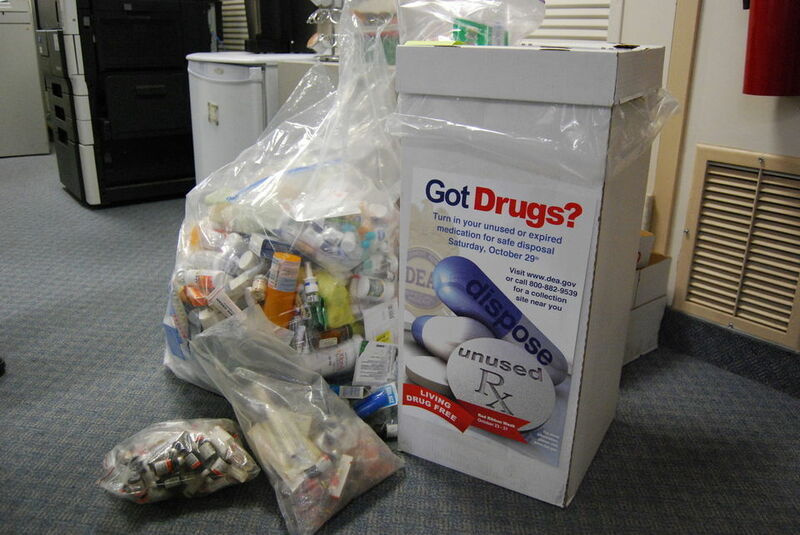 There is no question about the dangers and dramatic affects this situation has had on everyone. Thankfully the loss of life has been rather limited. 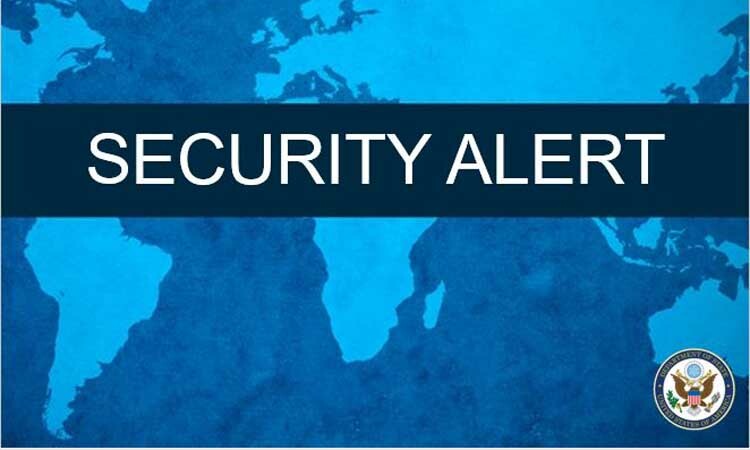 Nonetheless, with level 4 alerts from the state department, missionaries are being evacuated and all non-essential embassy employees are being sent home. I am not sure I understand the logic of all that, as missionaries are needed more than ever, and it may not be that much more dangerous than the all the of the subtle influences of the United States. 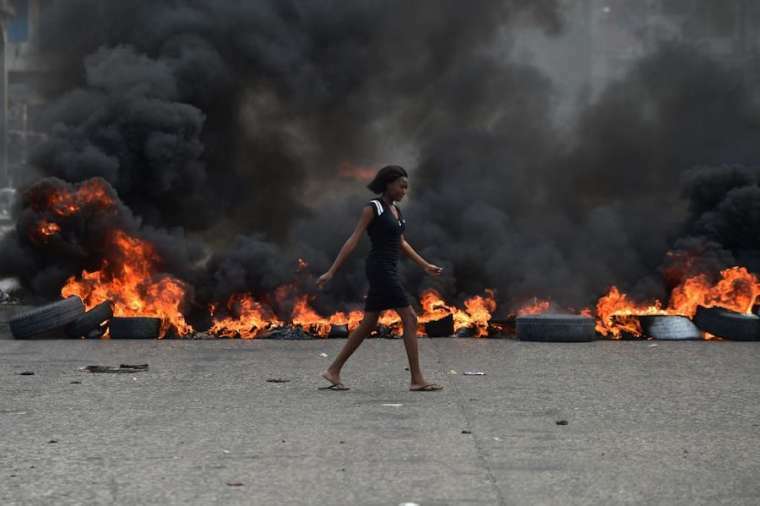 A woman walks past tire barricades set ablaze by demonstrators protesting in Port-au-Prince against Haitian President Jovenel Moise Feb. 10, 2019. Credit: Hector Retamal/AFP/Getty Images. On one particular day we had to take to the airport in the heat of the riots. This occurred the morning after an apathetic speech from the president who will not step down. 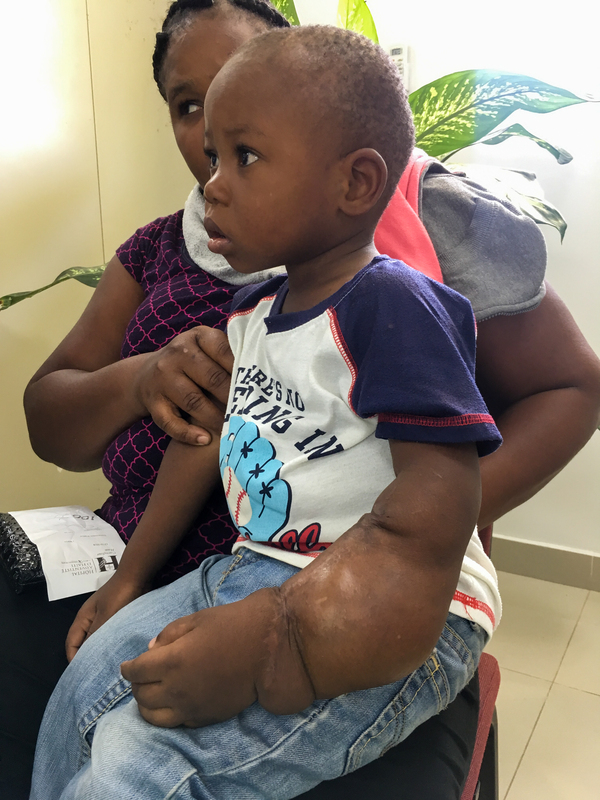 One of our patients asked if there was any way we could take him to Delmas in the ambulance and since Jere was going to the airport that day I arranged for the patient to go along. Patrick and Michel wanted me to come and bring an oxygen bottle and box of medical supplies so we looked official. Without that I don’t think we would have made it. We almost took our patient back to the hospital just so we could make it back ourselves. We had to navigate multiple road blocks and at one point this guy in a red shirt whose smile was almost as big as his muscles started running 50 feet in front of us clearing the way and negotiating passage with the barricade ring leaders. Some were quite stern and were armed. They looked inside the ambulance very carefully to make sure it was really functioning as an ambulance. 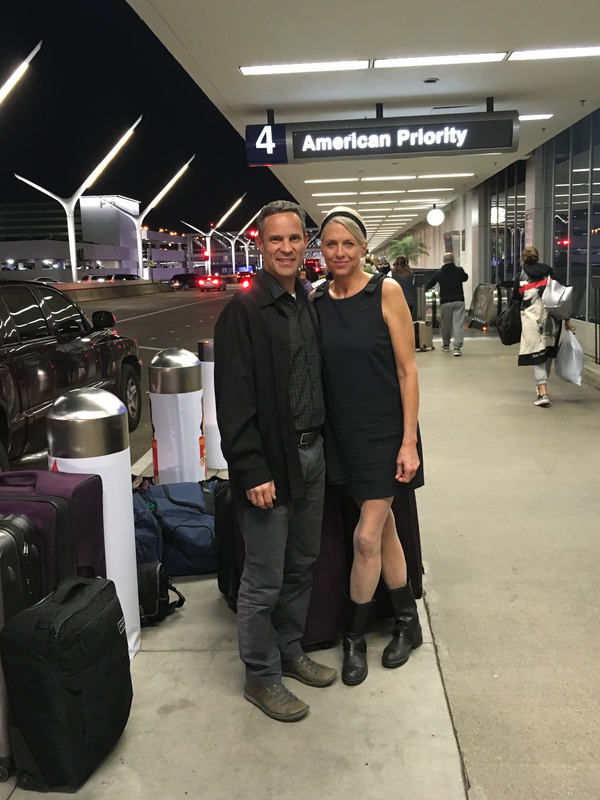 Fortunately it was… We had to navigate a lot of smoke and fire leaving a burned rubber smell on our clothes. Once the road cleared a bit the guy in the red shirt and his buddy held on to the outside of the vehicle until they were chastised by some police officers. 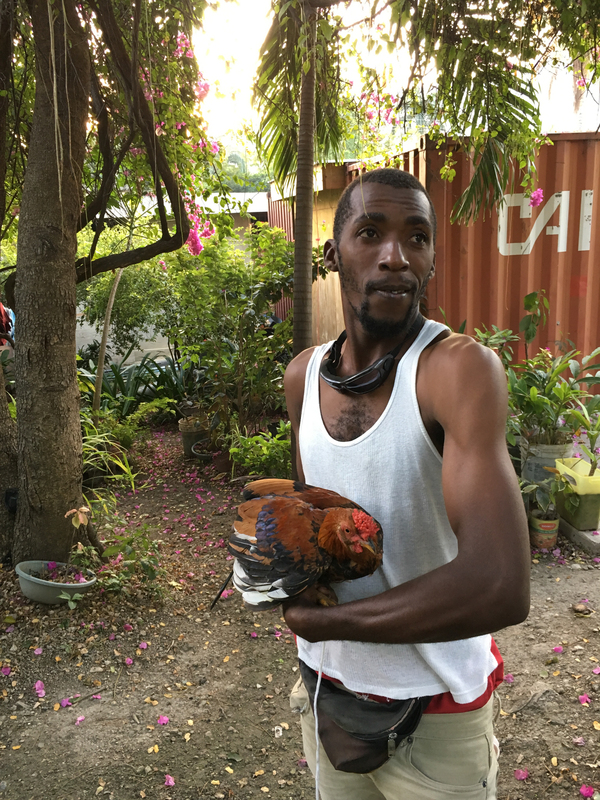 We had to let them go, but then after we let Jere off at the airport we went back and found the them and proceeded to Delmas to drop off the patient. Then Patrick had another prayer which the escorts appreciated. We gave each of them 500 gourdes ($7) and took down their phone number for future reference. In any case maybe not more dangerous than navigating your way by all the shopping malls and fast food joints on a trip from Loma Linda to LAX! The past several days I have been in the US on a previously planned trip. Dr. Alexis has been able to make it to work on most days and has taken care of several gunshot wounds. 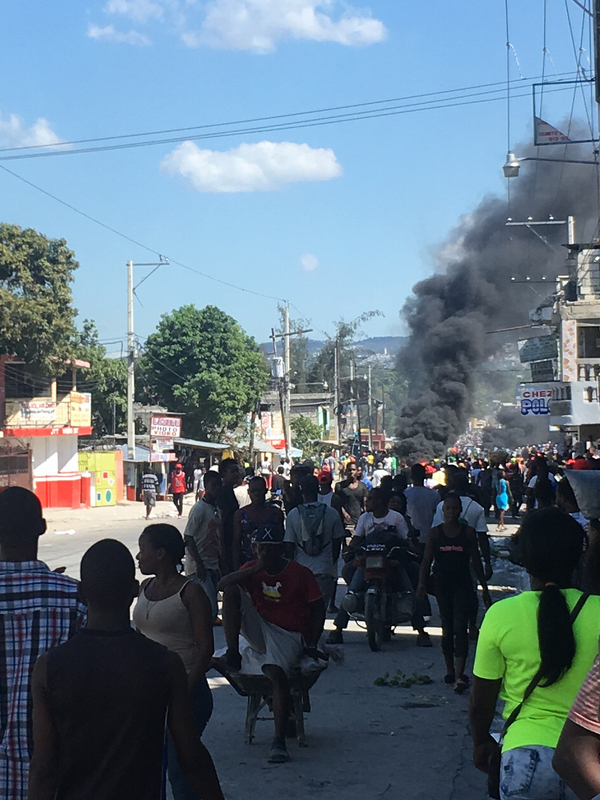 He said one of the days demonstrators were pouring oil all over the streets as he drove to the hospital from his home near Petionville. In Martisant (corridor between hospital and center of town) there were two citizens killed in one day and on another day a police officer was shot and killed by the bad guys. For those of you planning trips… predicting the situation is equally as difficult as predicting tropical storms. Forceful storms come and go rapidly as burning tires in the streets. I do imagine that until a major change in political power occurs that the situation will remain quite volatile. This is one of those dates that reminds me of where I was at 4:53pm on this same afternoon in 2010. People in America and around the world remember with clarity where we were on the morning of 9-11-2001 when 2996 people lost their lives. 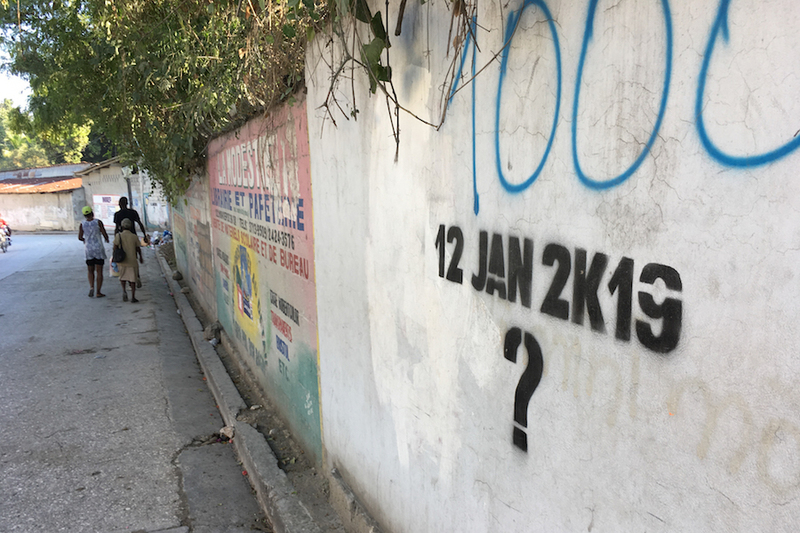 Today the Haitians remember every terrifying detail of this same afternoon 9 years ago when more than 200,000 people lost their lives. Special mention was made at our church service today in Carrefour about this event. Praise was given to God for bringing the people through this event and blessing them over the past 9 years, knowing that He has special plans for each and every one of us. I was not here, but I did experience the earthquake on my way home from work that day in Santo Domingo. Every detail of the next 72 hours is well engraved in my mind as this was a significant change in direction for me. I had been here to Hôpital Adventiste d’Haiti several times before. At the time these experiences were less than inspirational and the hospital had largely lost the luster of its early years. It was operating on a shoestring budget and striving to cater only to those who had significant resources. 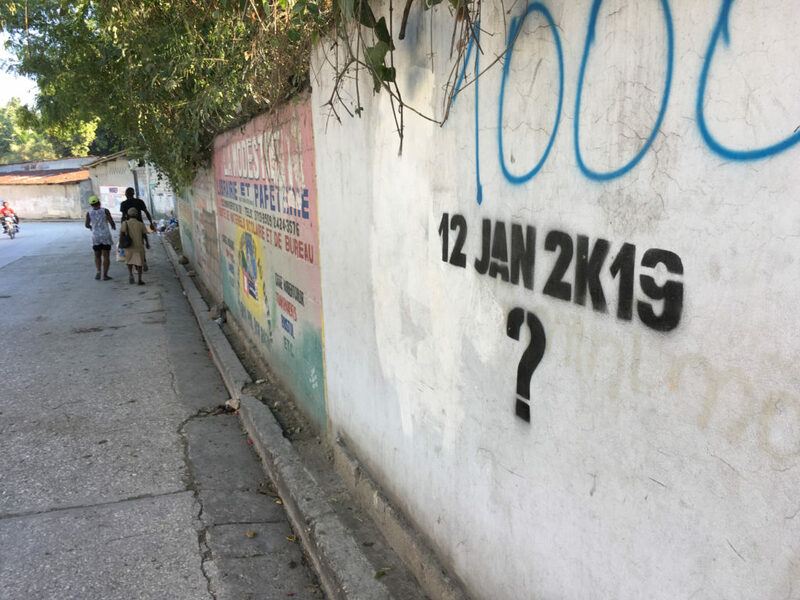 12th of January is a day that will never be forgotten in Haiti. Superstitions leave people wondering if something could happen again on this day 9 years later. 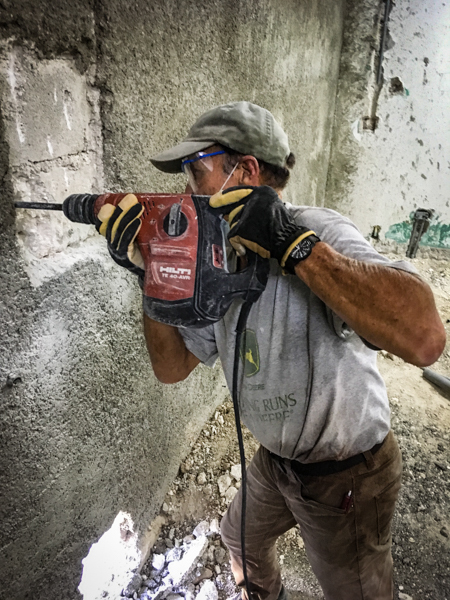 Before I arrived here in Port au Prince 48 hours after the earthquake I realized that in spite of the tragedy this may become an opportunity to recreate a mission hospital. The story is one that many of you have been part of. 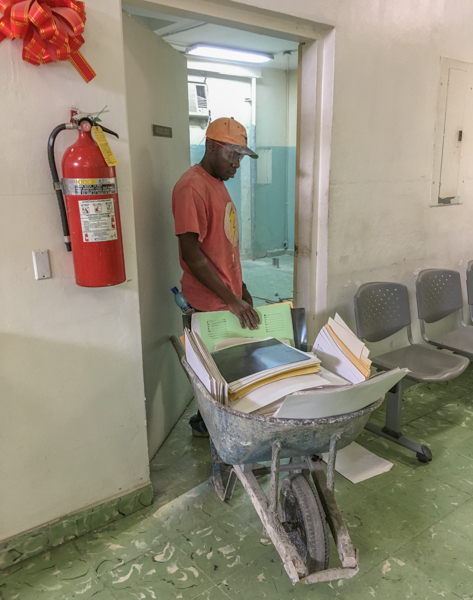 The deterioration of the hospital that had occurred in the years preceding the earthquake superseded any damages brought to the building which was the closest major hospital to the epicenter. 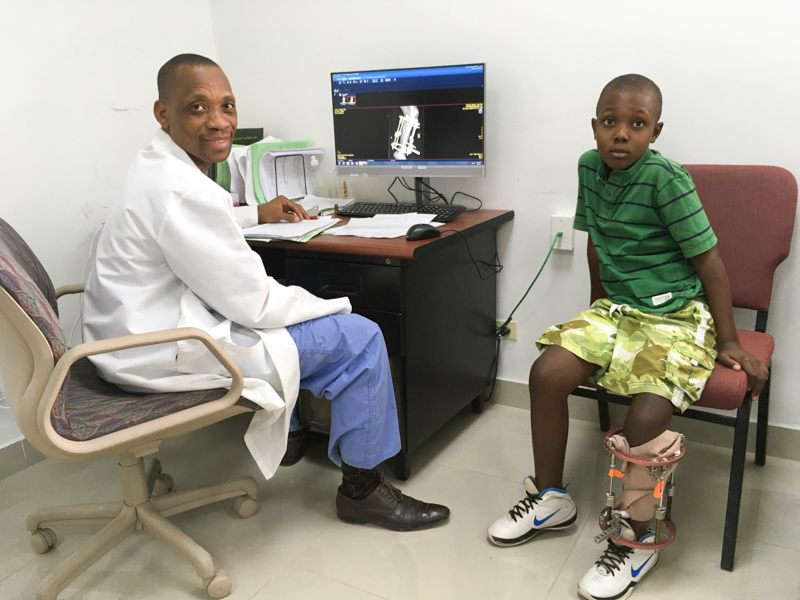 With great gusto and lots of external support an orthopedic program was launched. 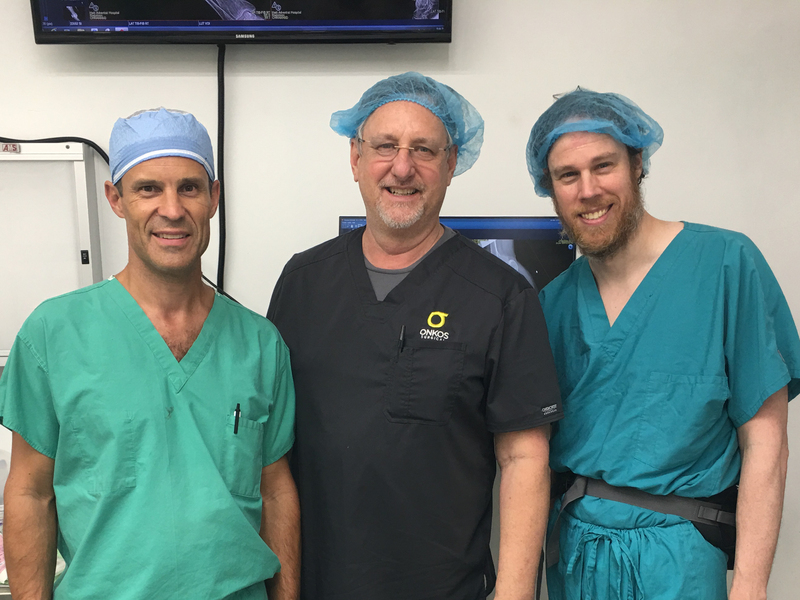 I spent 6 months working here full time and then Terry Dietrich came with his wife for another whole year and was joined by Dr. Francel Alexis who has been the mainstay of our program here over the last 8+ years. We have had many victories and frustrations, but when looking back there have been many more victories than defeats. 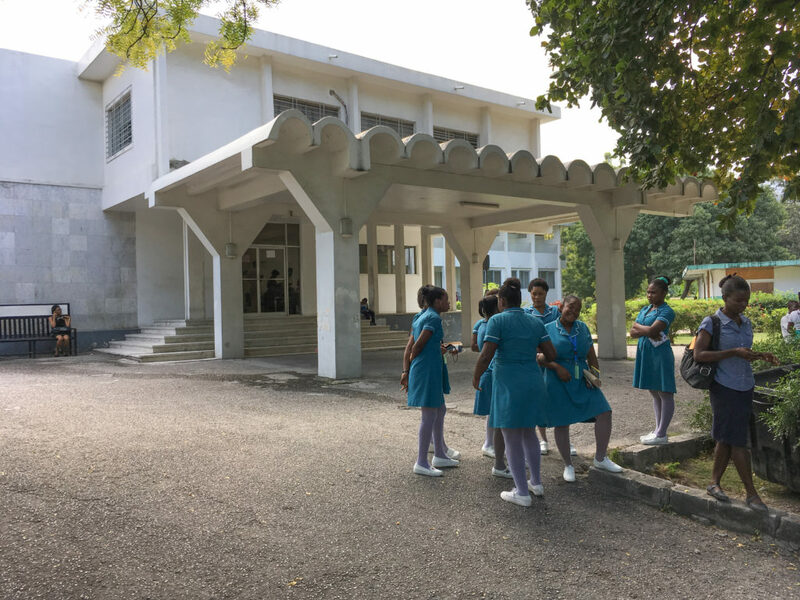 Nursing students prepare for their day in front of HAH. 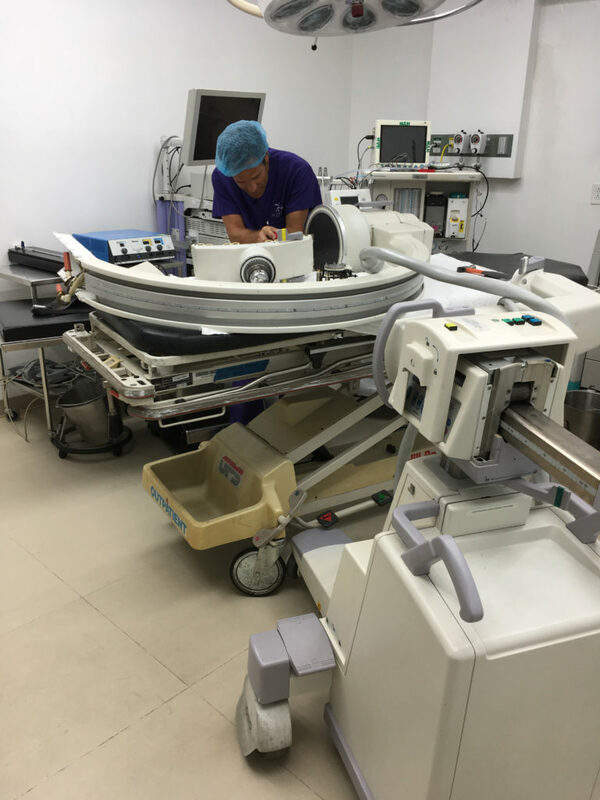 A major operation on the c-arm (intra-operative x-ray machine) this past week. The procedure was a success and it is functioning 100%. This week we made a significant leap towards realizing our mission of providing hope and healing to people of all economic classes. We now have a designated office for financial counseling and social support that will help facilitate communication and financial support for patients without sufficient resources. 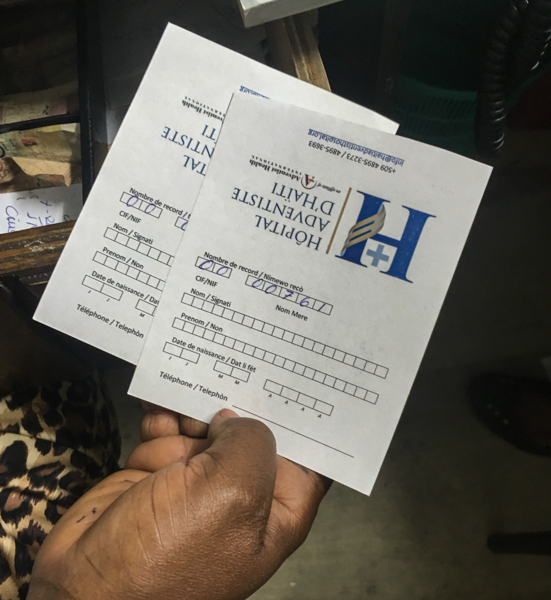 Developing prices for surgeries is always tricky in mission hospitals. If we make it cheap enough that everyone can afford it, then balancing our budget and paying our employees is difficult or impossible. 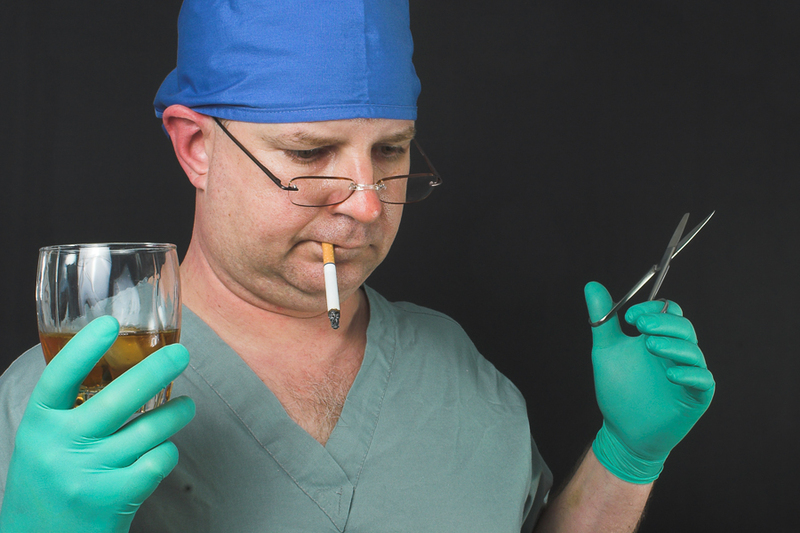 In addition other health care institutions would resent us for undermining them. If prices are too high then poor people get turned away. If they are in the middle then some of both problems will happen. This mandates some flexibility with pricing especially in situations regarding medical emergencies. Hopefully our new financial counseling office will help us to treat all of our patients with the highest level of dignity and respect. “Gospel Kreyol” sings for the Gaalad Eglise Adventiste on January 12. Bon Bagay means “Good Stuff” in Kreyol. If you say it a few times it becomes addicting. It is a fitting title for this week’s events. 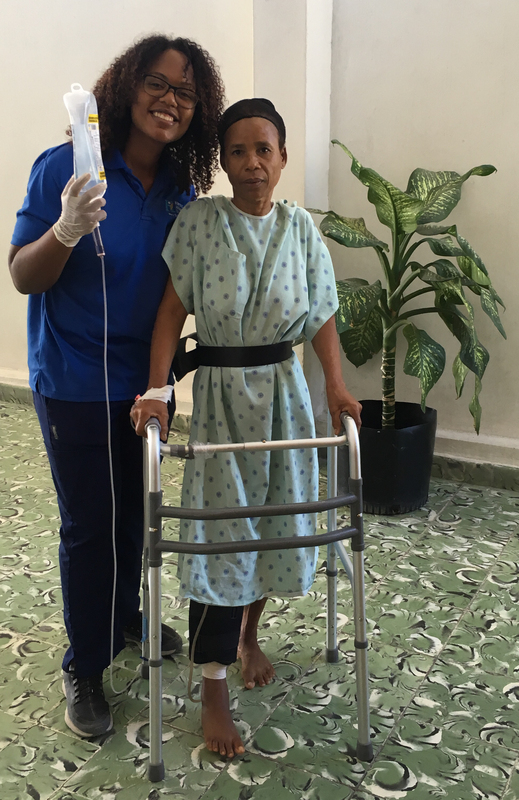 Team Sinai returned for their 7th trip to Hôpital Adventiste d’Haiti. 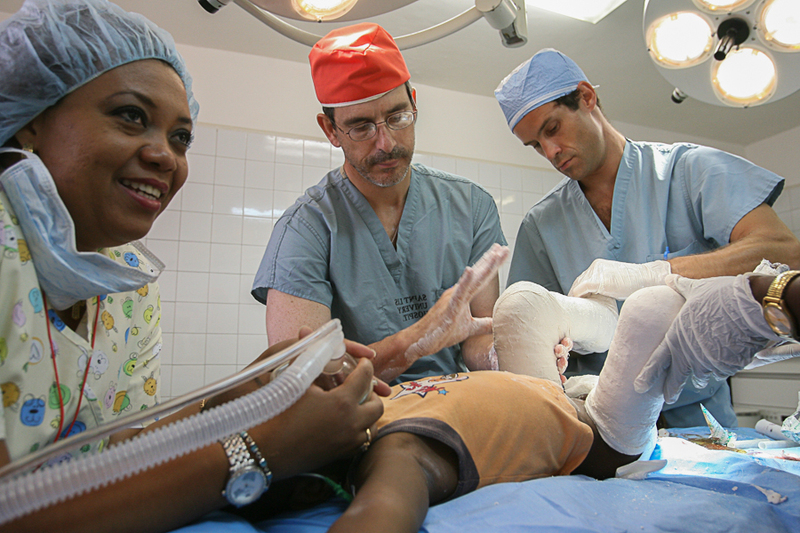 This is a group led by John Herzenberg MD one of the most respected limb deformity surgeons in the world. 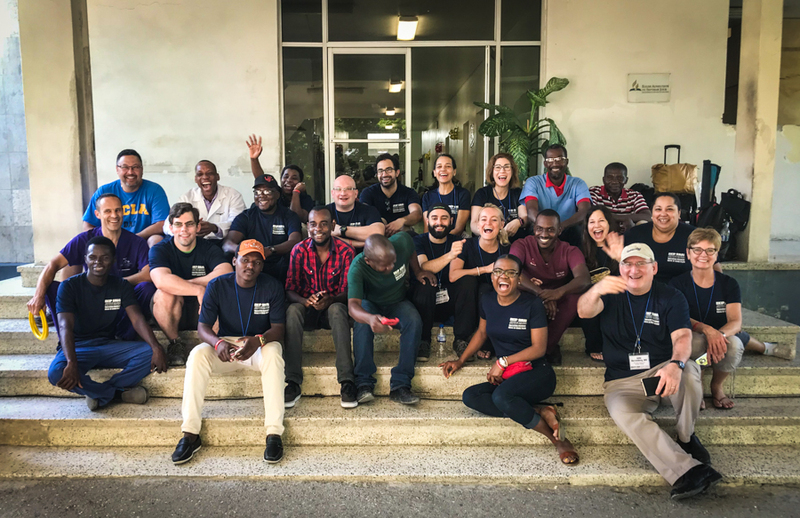 His wife Merrill is the organizer of these trips which include a comprehensive team of people from 6 different countries many of whom speak French and Kreyol. I first met Dr. Herzenberg in 2004 when I went to the Baltimore Limb Deformity Course as a young surgeon. He is the course chairman. 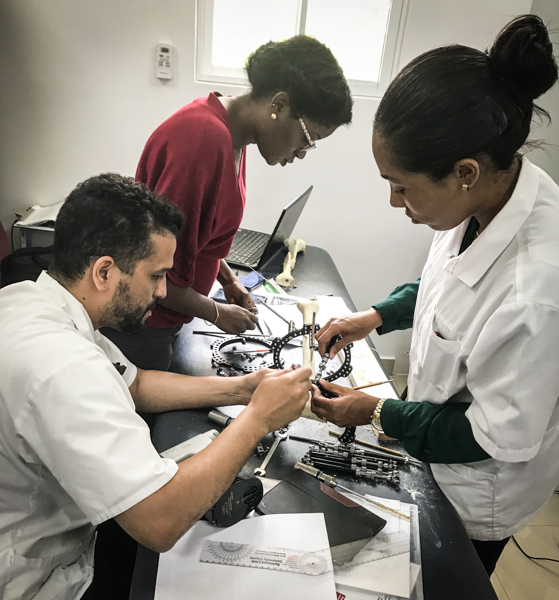 This course really opened my eyes to a new world of surgical possibilities and taught me many surgical concepts I had never before known. 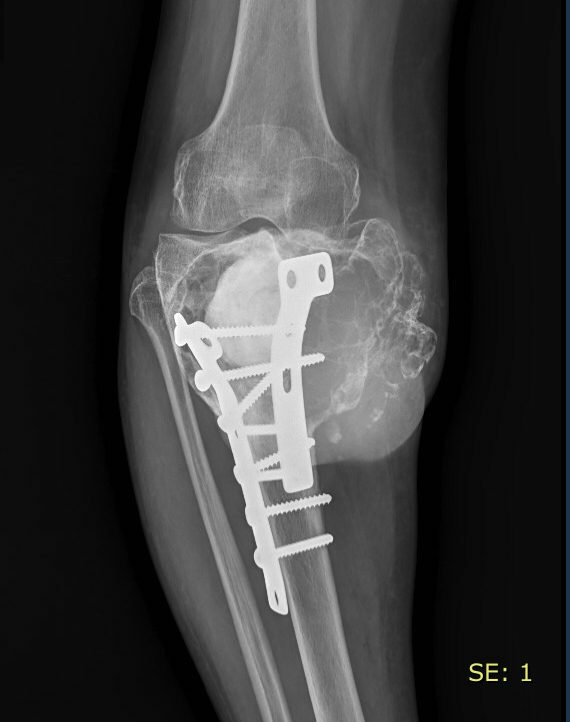 I learned about limb alignment, bone lengthening and gradual correction of severe deformities. 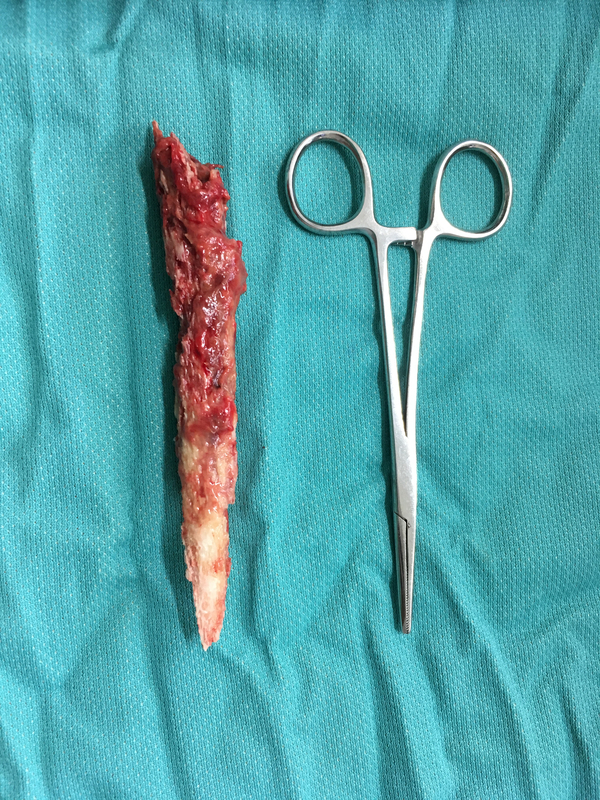 There is so much to learn that I decided to repeat the course two years later and at that time I asked if I could come and spend a summer in Baltimore at the International Center for Limb Lengthening. This was an amazing experience both for mentorship and learning. 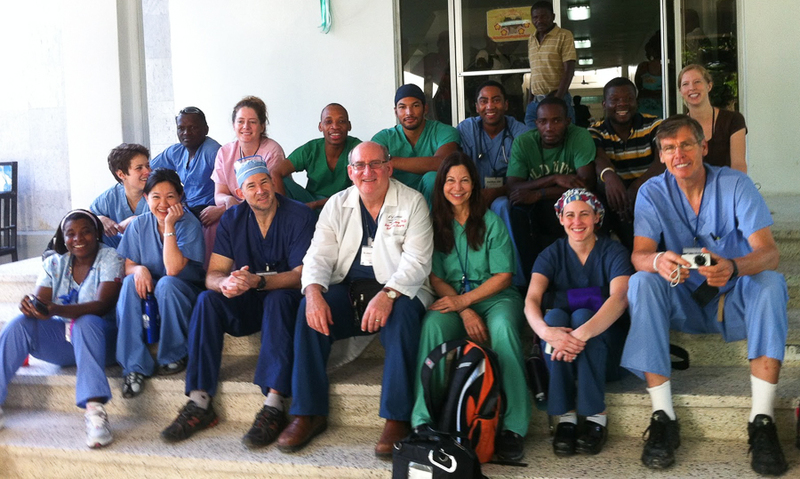 I never dreamed that these surgeons would all come down multiple times to work with me in Haiti and the Dominican Republic. 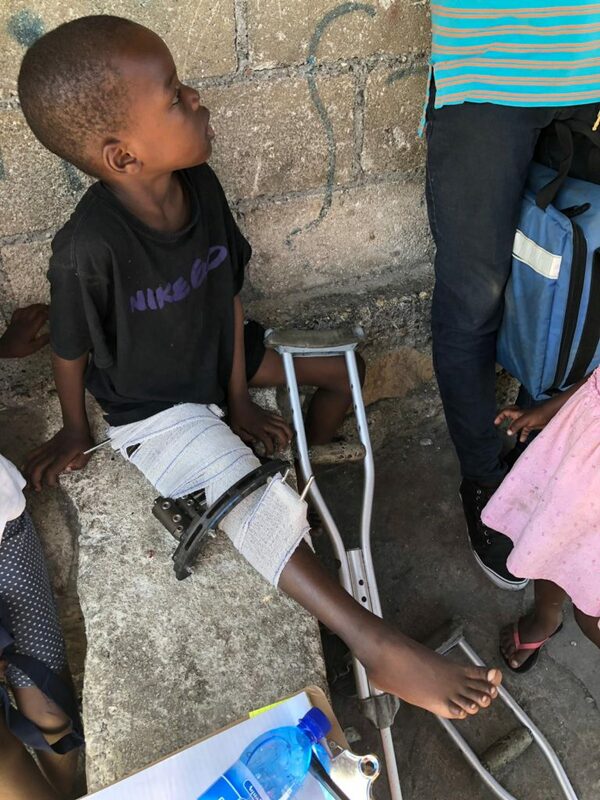 Mothers in Europe, the Middle East, and Asia are Google searching for well-known clubfoot and limb deformity surgeons and find John Herzenberg, meanwhile, moms come across Port au Prince from some of the worst slums in the western hemisphere to Hôpital Adventiste to find the same guy. Bon Bagay! We had a great week with the team which included a lot of operations as well as a Taylor Spatial Frame workshop. 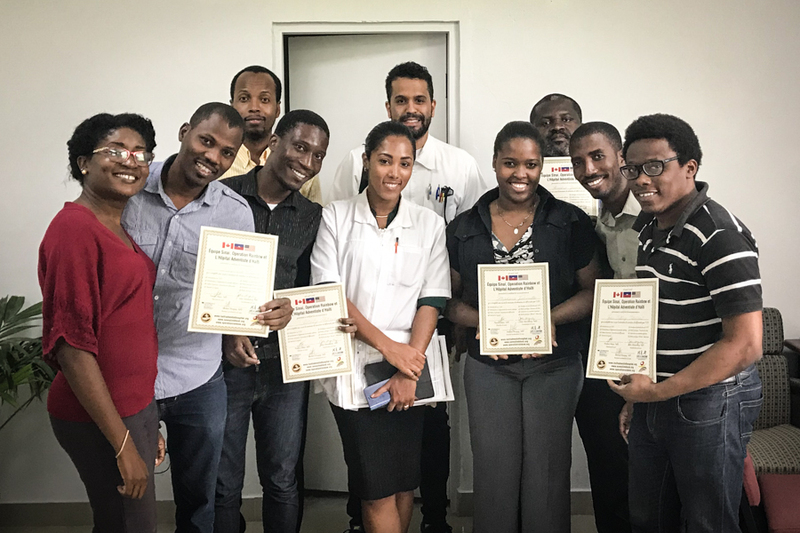 This consisted of 4 hours of lectures for local surgeons and residents and then another 4-hour laboratory session to teach hands-on application of the TSF (graduates pictured in banner image). 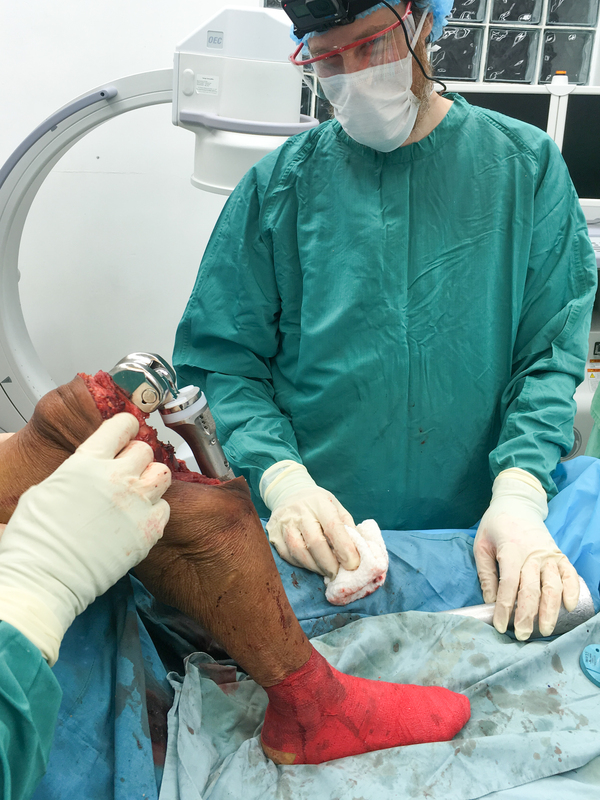 For those of you who are not familiar, TSF is a type of external fixator used for limb lengthening as well as gradual correction of various deformities. 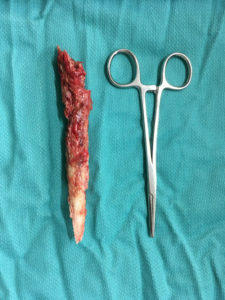 It is based on a mathematical theorem that allows you to correct all kinds of exotic deformities but requires some computer programming in order to do so. Meanwhile, a lot of other Bon Bagay is occurring at the hospital. 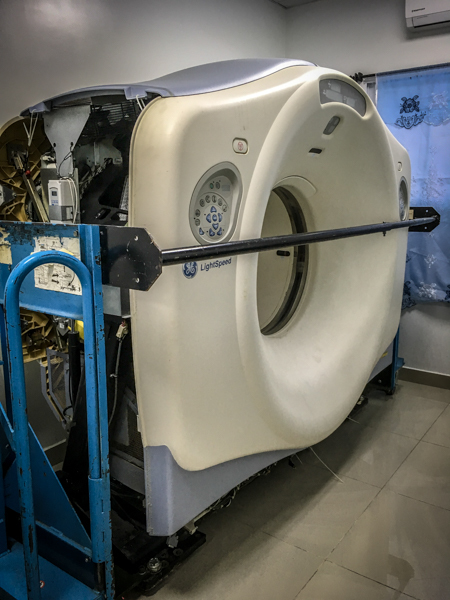 Last week a CT scanner arrived from Florida Hospital (see banner image). There are only 2 others to my knowledge in the country and one of them is usually broken down. The installation for this is quite complex as it needs a 480V line, so if you have cancer please don’t stand by until we get this thing up and going, it could be a little while yet. 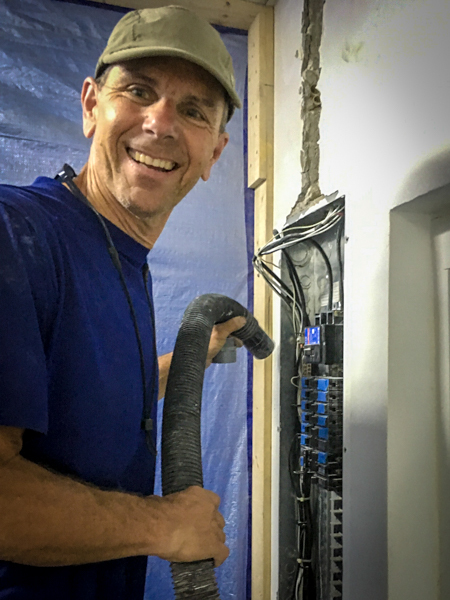 Thankfully we have an electrical master, JT Haas on site who is getting the job done. Previously he was in charge of power distribution for the central coast for Pacific Gas and Electric. He recently retired and is giving his time and expertise to help us solve some major issues. We were told these issues would cost about two or three hundred thousand dollars to fix, but by redistributing some of our power and working out some practical solutions JT is going to have the job done for less than $30,000. Bon Bagay! As I deplaned at MIA this morning, we were immediately directed towards an escalator leading to the Skytrain. I stepped on to the elevator and the young man about 25 years old right in front of me fell down and dogpiled with the man next to him on top of my bag as I tried to pad his fall. At that point, his feet were up and his head down as I struggled to lift him up. He looked like a young healthy man and did not seem to be drunk after this short morning flight. As I helped him up his friend explained to me that it was his “first time”. I said “welcome to the United States of America!”. I only know of one escalator in Haiti – it is in the arrivals hall at PAP. Out of the many times I have arrived there it has only been working once. 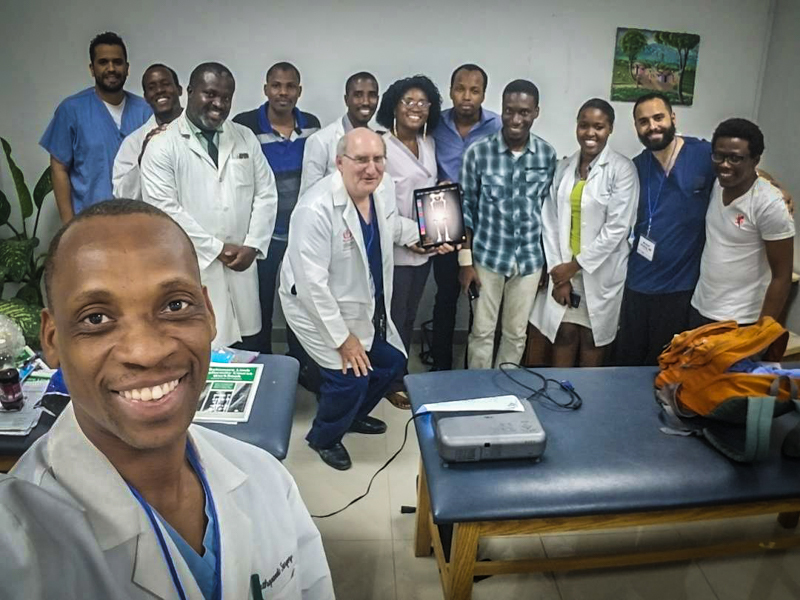 This experience gave perspective to some of the things we have been trying to accomplish at Hôpital Adventiste – commonplace endeavors to take us up to the next level sometimes end up in a dogpile at the bottom of the escalator as we tumble over each other trying to communicate, understand and stand up again. One such endeavor is our new PACS system. Some of you may not know what that is, and the rest of us who do, still might not know what those letters stand for…Picture Archiving and Communication System. 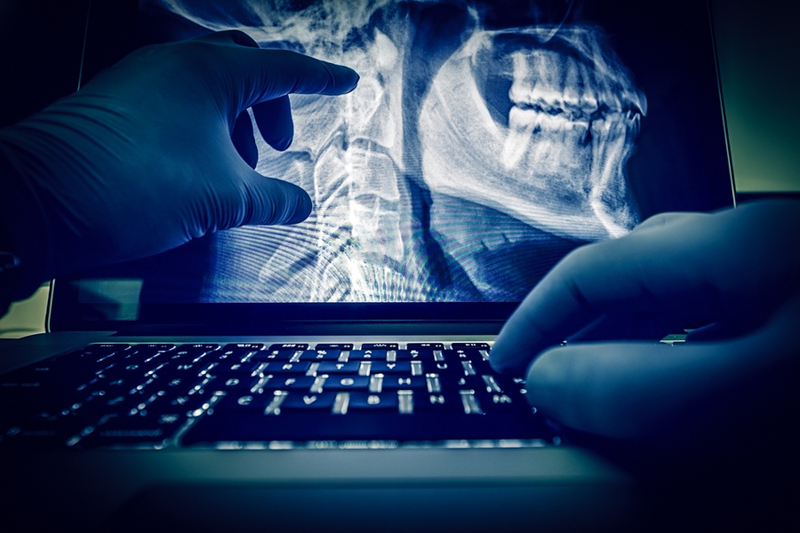 Virtually all hospitals in the United States now have such systems which electronically store radiographic images. This technology is to the traditional x-ray what digital cameras are to film cameras. The way it works is by the use of a 14×17” digital detector which is the size of a standard x-ray cassette. 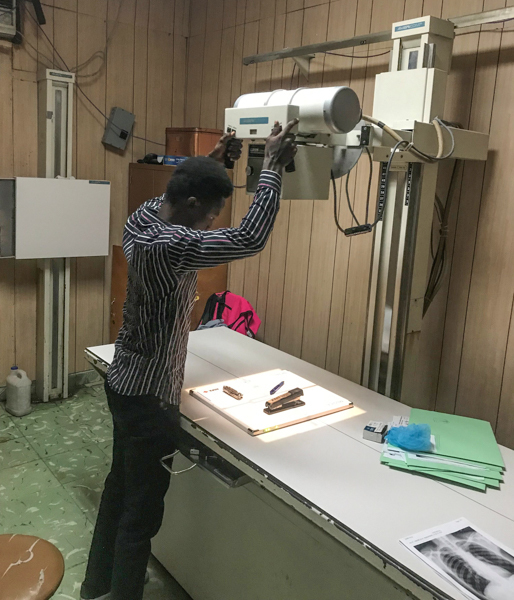 X-rays out of any old, new, portable or stationary machine can be beamed through the patient onto the DR detector and voila! The image shows up on an adjacent computer via Bluetooth. It is then labeled, edited as necessary, and archived onto our server using an Agfa PACS database program. 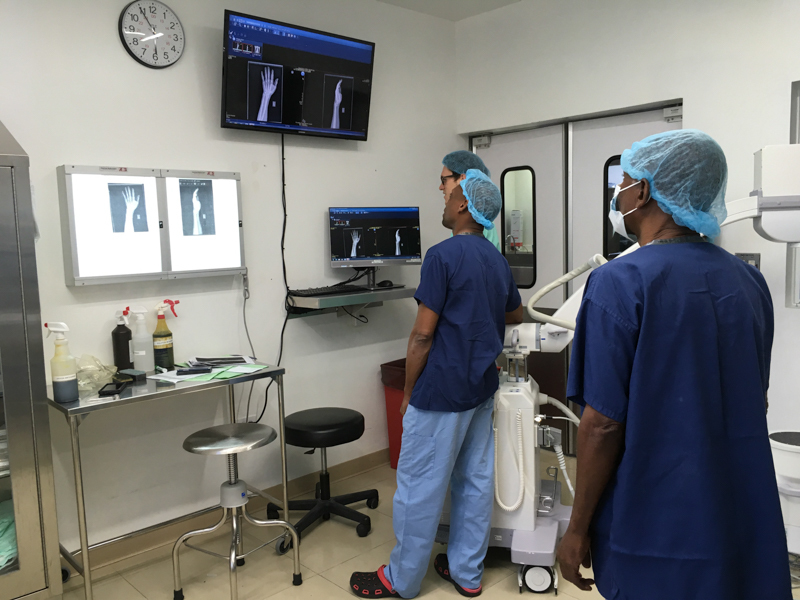 The benefits of a digital system especially at a mission hospital are many. 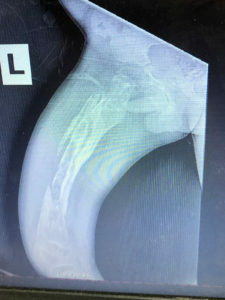 Film x-rays often require about $20 US of film and chemical per study. 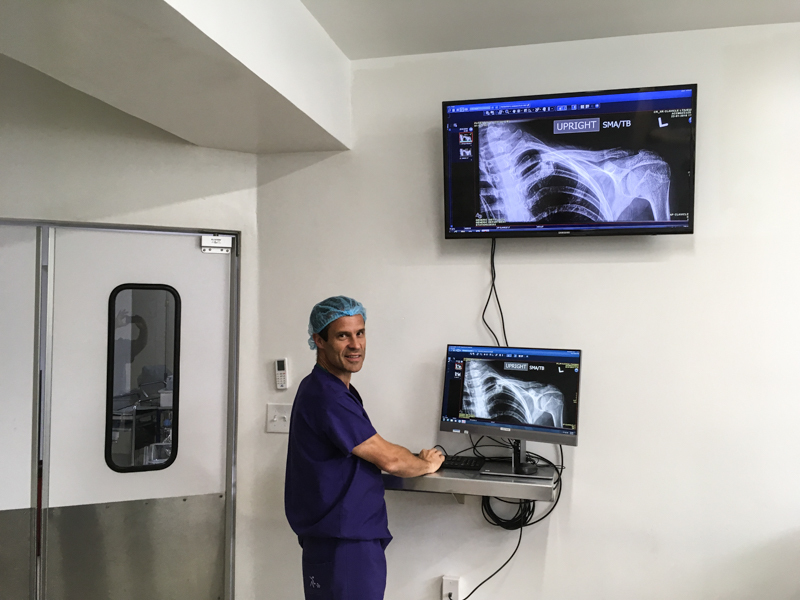 Bypassing the need for film allows us to more easily afford x-rays for people who cannot pay and yields more profit for the folks that can. 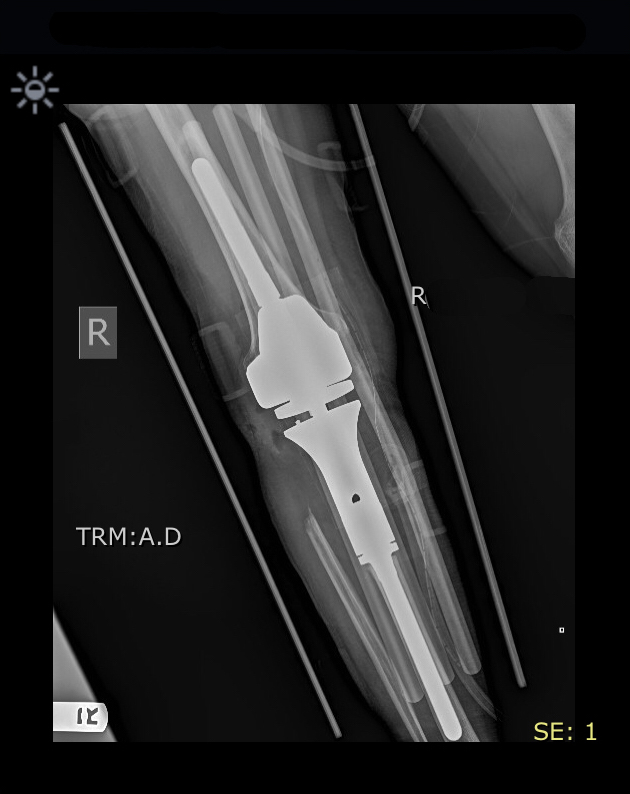 If a poorly performed x-ray is taken then it can either be edited for clarity or retaken without wasting materials. 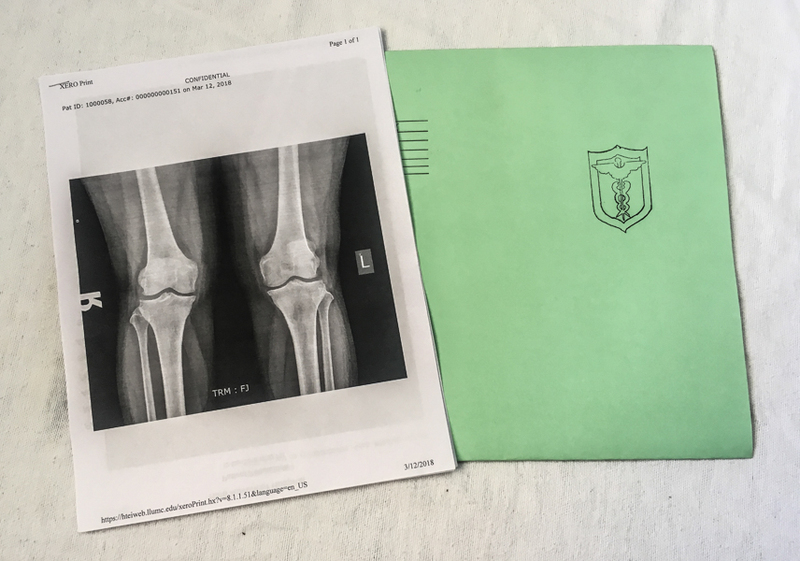 Gone is the day that you could not get an x-ray because the patient could not afford it and you did not want to put your hospital further in the lurch! Now we are lowering our prices, creating more accessibility for the common man, woman and child with an even better quality of care than before. The reality of this system occurred over a cup of coffee early one morning on my way to work at LLUMC last November. 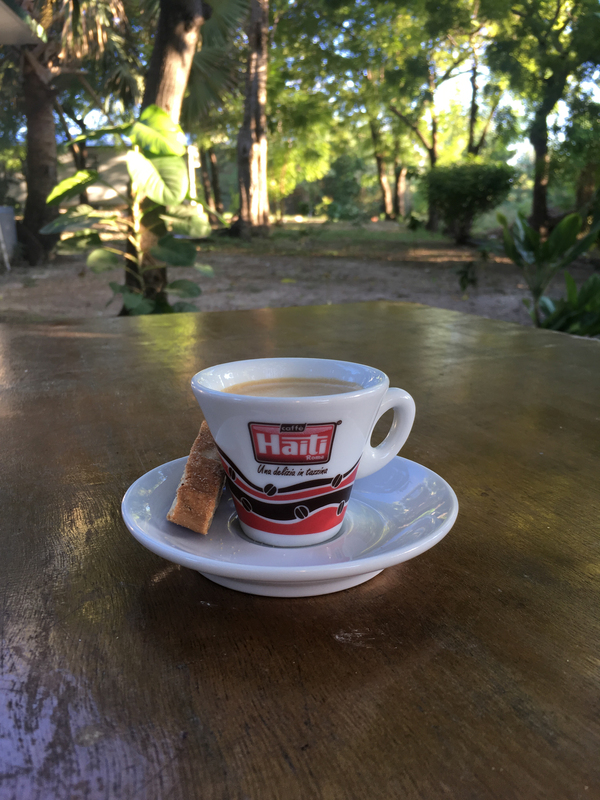 I met with a friend who told me to let him know if I needed some financial support for a project in Haiti. 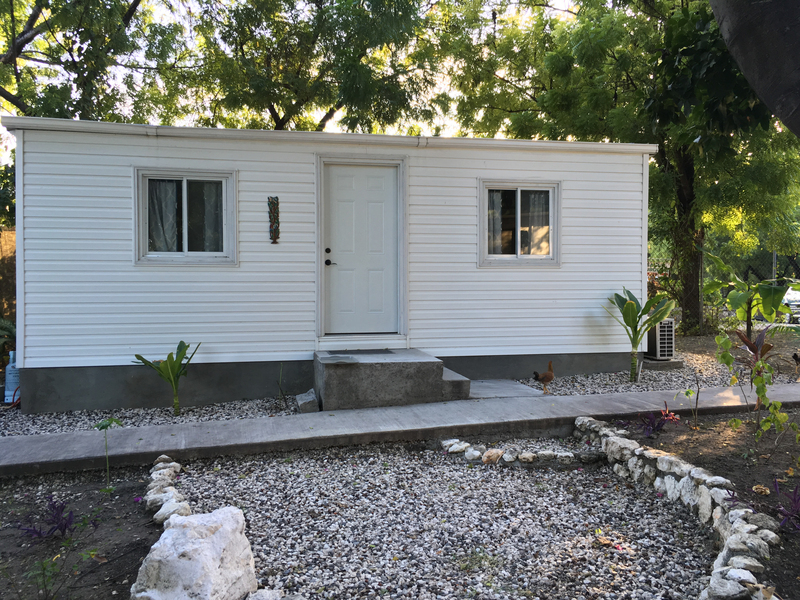 I presented him this idea thinking that he may be able to provide a small jumpstart for this $95,000 project. Halfway through our cappuccinos he had heard enough of my enthusiasm to reach his hand across the table and shake on a promise to fund the whole project! 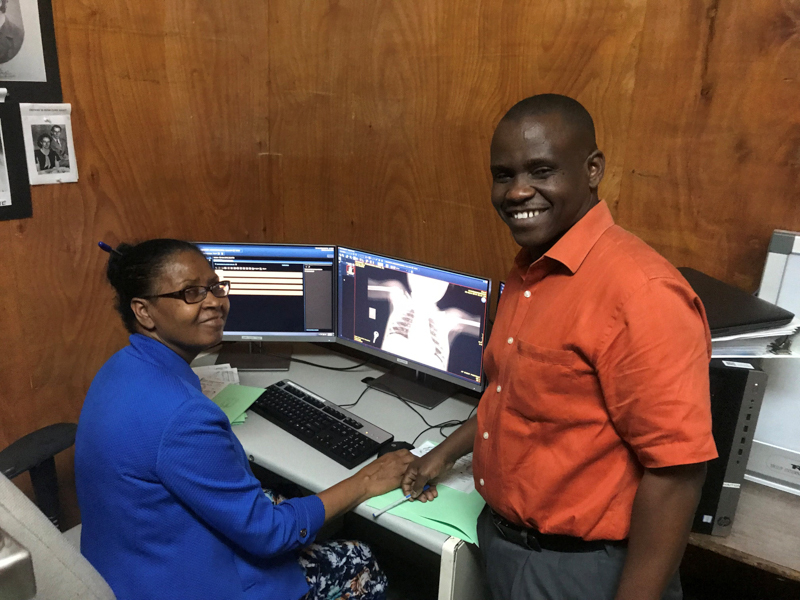 Mike Haman director of our PACS at LLUMC used his VIP status with Agfa Healthcare to strike a 70% discount on the software and then put the whole system together, travel to Port au Prince and spend a week for installation and training. Entering good data with consistent attention to spelling and details is where we began to stumble at the bottom of the escalator. We soon discovered that there were at least 7 existing medical record numbering schemes, with many patients having duplicate numbers. 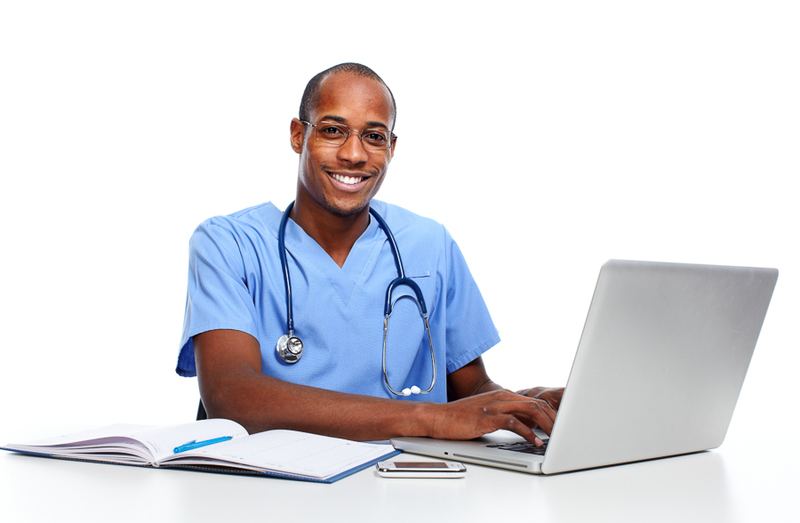 Continuing with this database nightmare would create chaos and frustration when searching for patient images. Fortunately, Jere Chrispens, our CEO is a seasoned IT executive who was able to come to the rescue. An eighth medical record numbering system was created with a consistent 7 digits to supplant all previous systems. It seemed like a simple scheme but various complexities arose which created moments of frustration amidst the joys of our new system. This has now led us to create a demographic database in order to avoid duplicate record numbers, have the consistent spelling of names, and contact patients when needed. These concepts don’t intrinsically exist in Haiti. But by padding the falls, communicating, and helping to lift each other up we are standing on the escalator and moving to the next level. Welcome to HAH!